January 15-16 | 2019. The Great and The Forgotten | Peter M. Schloss | J.D. - Mediator. Over a span of 48 hours I have had 2 vastly different experiences that were courtesy of both The Great and The Forgotten. In 1938 a collaboration between the University of Texas and the University of Chicago established the McDonald Observatory in the Davis Mountains of Texas. Named after its benefactor, William J. McDonald, who donated $800,000.00, the Observatory quickly became a preeminent research facility. The 82” Otto Struve Telescope was dedicated on May 5, 1939, and at that time was the second largest telescope in the world. The 107” Harlan J. Smith Telescope became operational in 1968 and at that time tanked as the third largest in the world. It now ranks 41st. The Harlan telescope weighs 160 tons and is housed under a 220 ton dome. Both the scope and dome rotate to track celestial objects, remarkably power by only half horsepower motors. The most recent addition to the large telescopes at McDonald is the 390” Hobby-Eberly Telescope (HET), dedicated in late 1997. It is composed of 91 separate 1 meter hexagonal mirrors. 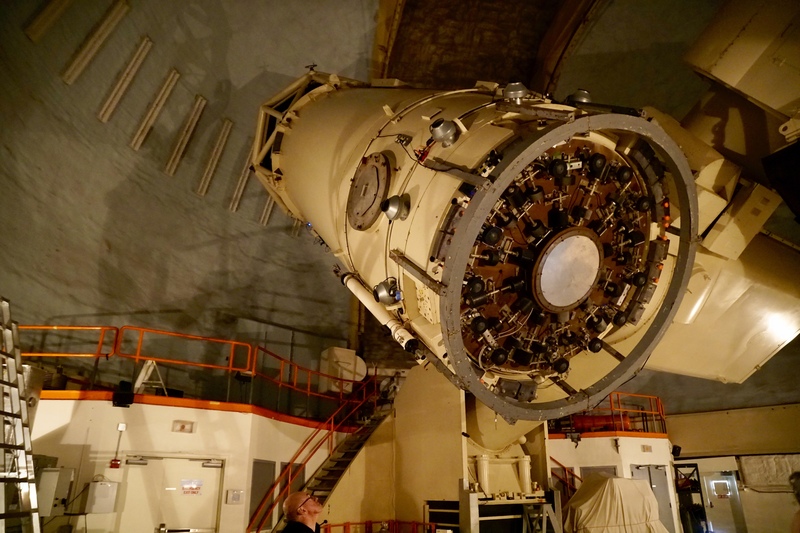 It currently ranks as the second largest optical telescope in the world and was constructed at the bargain basement price of 40 million dollars by using common construction materials available on the open market. The Observatory is located atop 6,780 foot high Mount Locke and is in a prime “Dark Sky” region with little rain and predominantly clear skies. The Observatory includes dozens of smaller telescopes. We enjoyed both a daytime tour with solar observations and a nighttime “Star-Party” with observations of the moon, star clusters, and a the Orion Nebula. The Observatory, its largest telescopes, and other noteworthy parts of the facility display the names of The Famous who have expanded our understanding of the cosmos. Perhaps among The Forgotten are the thousands of workers and technicians who built the facility and keep it running each day. The current on-site housing for the staff makes the Observatory the second largest “town” in Davis County. Between 1933 and 1942 over 3 million economically destitute unmarried men between 17 and 28 years old enlisted in the Civilian Conservation Corps (CCC). The CCC was a huge government funded public works/relief program that was born of President Franklin D. Roosevelt’s New Deal. Nearly 90 years after its inception the hand of the CCC can be seen in forests and parks across America. Construction of Davis Mountains State Park was begun by the CCC in 1933. The workers constructed roads, trails, pavilions, and the magnificent adobe Indian Lodge and restaurant which remain in operation today. I hiked the trails and abandoned roads that These Forgotten built with their grit, sinews, and sweat. There were no Famous among them to warrant the naming of these artifacts that remain, yet on this day I was the direct beneficiary of their efforts. I have no one person to whom I can direct my gratitude for a day well spent, so I give my thanks to The Forgotten. PS. I have often heard the rhetorical question, “Why isn’t there a CCC today?”, followed by the questioner’s own answer that is a criticism of “the Younger Generation”. Here is my thought: The CCC was first and foremost a government funded relief program. There was little thought given to profit or benefit other than for the unemployed workers. The current political climate does not favor public relief or social welfare. Additionally, the workers were driven to enlist in the CCC (and WPA) out of their own economic necessity. If circumstances were to repeat (and I pray that they don’t), I have every reason to believe that “the Younger Generation” would roll up its sleeves just like “the Greatest Generation” did. ← January 17, 2019. Judge Roy Bean. It was a lifesaver for so many families. Looks like== from the depressed to the sublime. Mannington has a beautiful park and swimming pool and community building from the 30″s funded by the WPA project. I remember that place fondly from my childhood. Very jealous that you were able to visit the Observatoty. They were very instrumental in helping us develope Cherry Springs as a Dark Sky Park especially in regards to our educatioal outreach programs. Hope you enjoyed the stars..they never cease to amaze me by we have been very short on clear nights around here. I’m just now catching up to your posts after my ear surgeryand the unfortunate throat and mouth infection that resulted…If I were a cow, I’ d be shot for hoof and mouth disease! Maxine, we are thinking of you! !